When two men enter the Amazon rainforest, the vibrant sounds of life cease and there is an sense of unease. One of the men directs the other to cut down a large Kapok tree and leaves. The other man begins to chip away at the tree with an ax, but it is difficult work and he soon tires. He takes a break and falls asleep, and it is here that the magic of The Great Kapok Tree begins. While he sleeps, residents of the rainforest visit him, individually extolling the virtues of the tree and its importance. The boa constrictor tells him that this is a tree of miracles, where his family has lived for years. The bee tells him how important the tree is for their hive, weaving together the interdependence of the natural world. Birds tell him they have seen the smoldering remains of other areas of rainforest that have been logged. “Senhor,” a small treefrog says, “a ruined rainforest means ruined lives…many ruined lives.” There are additional appearances by a jaguar, a Yanomamo child, a sloth, porcupines and anteaters, each making a short but powerful persuasive statement about the beauty and power of the tree and its place both in their lives and in the greater ecosystem. The ending of this story is a hopeful one, for the man awakens to see the wonderful creatures around him, appreciates the beautiful light and the fragrance of the flowers in the forest and…puts his ax down. It is up to you, the caregiver, to leave the story as is or explain to your children that most of the time, the folks outside of the book are not making the same choice. 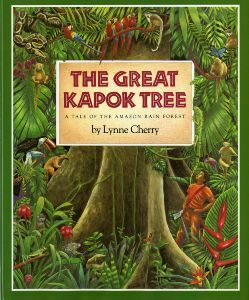 The Great Kapok Tree is one of the best children’s books about the plight of the Amazon rainforest that I’ve come across. Author and illustrator Lynne Cherry (who illustrated The Snail’s Spell) provides enough detail to lay out the challenges. Her storytelling, combined with her rich illustrations, do not engender fear but rather curiosity and awe. It is disheartening to note that that this book was originally published in 1990, and much of the concerns are still topical if not more pressing. What a nice review! This is one of my favorite books to read to my Kindergarten students, who always love it when the man lays down his ax. Even 5- and 6-year-old children understand the concept of making choices–we can’t lay down our axes literally, but what can we do to help the Earth? Lively discussions about recycling materials and conserving water follow. It’s a beautiful book I hope more teachers and parents will pick up. I love that you’re using this book in the classroom, Debra. My daughter’s kindergarten class focused on water conservation last fall. They visited a hotel, where the manager told them that guests were using too much water and asked for their help. The students ultimately created doorhangers for the hotel, each with a depiction of the water cycle, haikus about water, and an image of a superhero showering quickly with the invocation “Ducha rapida!” (“Shower quickly!”). The teacher had the doorhangers professionally printed using the students’ words and artwork, and they were beautiful!